(Member blog post) Ariiiiiiiiiiibbbaaaa!! 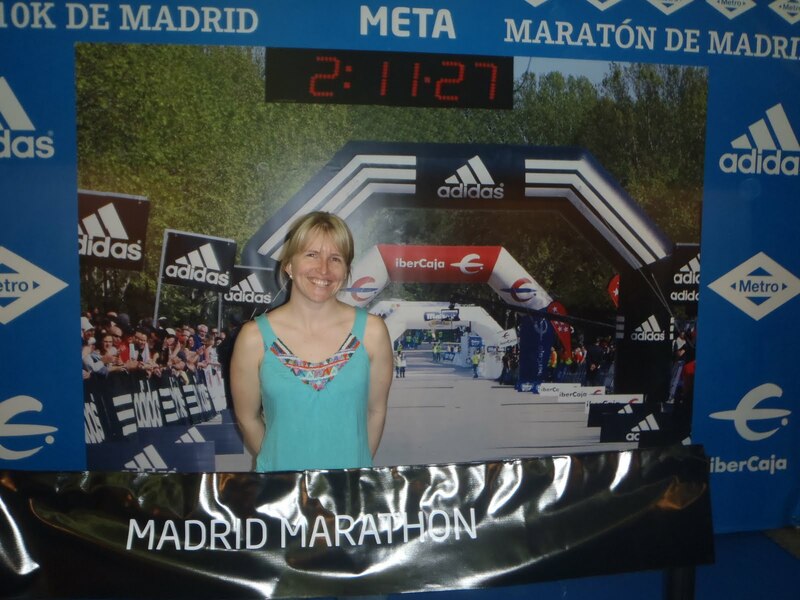 Maraton de Madrid! Check out my time & I’ve barely raised a sweat! First off, huge big congrats to all the VLM runners – fantastic stuff!! I was thinking of you all starting as I was into the first hour of my run! Madrid started off with a dubious ”dunk-a-weetbix” in a glass of milk breakfast at our hostel. There was no common room, so we sat on a bench in the passage in our running gear at 7am, much to the bewilderment of our fellow roommates – why are they getting up so early? Just before the start gun went off, we looked up to see parachutes flying in to send us off. This race was unique as they had a 10km fun run start alongside us…at first I was thinking…pffft, 10K – what’s that? this is a marathon…but when they turned off after the first 5k’s and gave us a huge round of applause as the two races parted, well, the 10kers were a lovely bunch of people to have around! The first half I was on fire, running just ahead of the 3:45 pace maker and bopping along to my special marathon soundtrack of ”eye of the tiger”, a crazy spanish man made ”slow down” gestures at me and indicated that a hill was coming up – pffft, what did he know? Turns out, he knew a lot more than I thought I did! I took the first few hills in my stride, but around the 30k mark and two packets of jelly beans later, it was getting tough! The heat of the day was setting in (25 deg) and I was beginning to appreciate my beginners spanish lessons! Venga! Venga! Chica! (Go go girl!) and Muy bien (very good) were very welcome cheers….some were telling me to ”vamoos!” – which I hope they meant in a nice way! I felt myself dropping back but kept the arms pumping and the legs trying to follow suit! Paramedics on rollerblades skated through the runners, giving us much needed ice sprays & dollops of vaseline – brilliant idea! At around 5k’s to go, I watched the balloon of the 4 hour pace-makers drift past and couldn’t understand why they were running so fast!! My legs were shot! I finished in 4:08, so not too far behind! Those 8 minutes are for the birds! 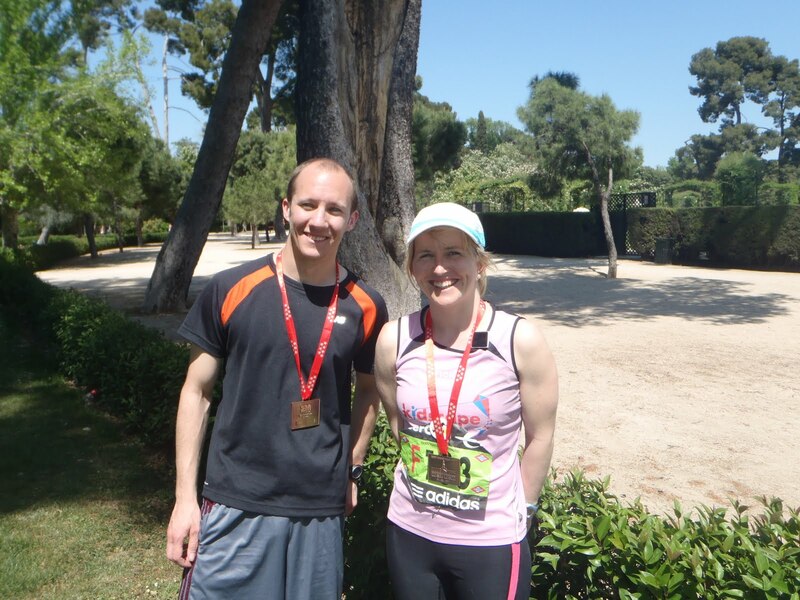 I was so relieved to finish I burst into tears – what a drizzbag photo that’ll be! Aftwerwards, we found ice creams and lay in the sun in the park for what felt like hours as movement was just not an option any time soon!Ah, another marathon under the belt & I just keep wanting to do more! Which one to do next?? ← (Member blog post) Jelly Tots…not Jelly Legs…. Well done. Madrid has a reputation for being REALLY HARD!